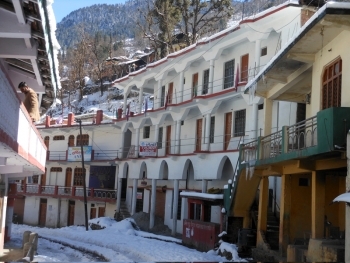 Hotel Anil is one of the most prestigious and unique Budget/Deluxe hotel in Yamunotri (Uttarakhand). It is an ideal place to stay in Rana Chatti, if you are visiting Yamunotri Dham. The hotel Anil is located in picturesque surroundings of Garhwal Himalayas, with the panoramic view of snow-capped mountains from the window of your room. It is located at a distance of 13 kms from Yamunotri in Rana Chatti Region. Ranachatti is just 5 kms from Sayana Chatti, 3 Kms from Hanuman Chatti, 6 kms from Banas (NaradChatti), 8 kms from Phool Chatti and 11 kms from Janaki Chatti. 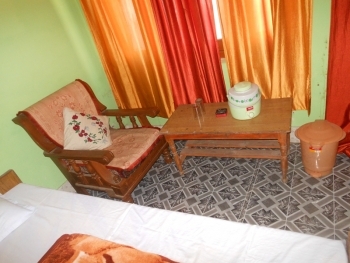 The hotel have basic facilities to to make stay comfortable and memorable one. There are single rooms, double bed rooms and family suites in Hotel Anil, to suit the varied needs of every traveller/pilgrim. Every room is amply structured to enhance the finest experience along with the entire contemporary facilities. There is a multi cuisine restaurant in hotel which offers Indian and Chinese food to the guests. By Air: Jolly Grant (Dehradun) Airport is the nearest Airport to Rana Chatti (Yamunotri) situated at a distance of 210 kms. Taxis are available from Jolly Grant Airport to Rana Chatti. By Rail: The nearest railway stations to Rana Chatti(Yamunotri) are Rishikesh and Dehradun. Dehradun railway station is situated 175 kms from Rana Chatti(Yamunotri) and Rishikesh railway station is situated 200 kms before Rana Chatti(Yamunotri) on NH58. Rishikesh and Dehradun are well connected by railway networks with major destinations of India. By Road: Rana Chatti(Yamunotri) is not directly connected with motorable roads and the trek commences from Rana Chatti(Yamunotri). Rana Chatti(Yamunotri) is well connected by motorable roads with major destinations of Uttarakhand state. Buses to Rishikesh are available from ISBT Kashmiri Gate. Buses and Taxis to Rana Chatti(Yamunotri) are easily available from major destinations of Uttarakhand state like Rishikesh, Dehradun, Tehri, Uttarkashi, Barkot etc.